Many of our candidates will hold key positions at other institutions and will only submit an application if confidentiality is guaranteed. Members of the Search Committee have signed an agreement that secures confidentiality for all discussions and deliberations related to the presidential search. What is the role of the Search Committee Co-Chairs? The search co-chairs are the official spokespersons for the Search Committee. The co-chairs will provide regular updates to The College of St. Scholastica community and will address any questions or concerns from members of the community through the duration of the search process. The Search Committee’s role is to advise the Board of Trustees on the selection of finalists and final candidates. The Committee is made up of representatives from the College’s administration, faculty, staff, students, and St. Scholastica Monastery. The Board of Trustees will take the Committee’s input under advisement as it ultimately makes the selection of the 13th president of the College. What information can Search Committee members share with me? The search committee is restricted in the information that it is able to share with the St. Scholastica community. The confidentiality statement that all members have signed requires that they not share any information discussed during search committee meetings and that they not share any information related to candidates, even after the search has closed. Whom do I contact if I want to share specific information or if I have a question about the search? As per the confidentiality statement and charge to the Search Committee, search co-chairs Mary Ives and Phil Rolle are the only individuals authorized to speak on behalf of the search committee and the search process. Please contact the search co-chairs or search consultants Shannon McCambridge and Dr. Loren Anderson if you have information that will be helpful to them. Yes; the search co-chairs will provide regular updates to the College community at critical points in the search. Please check the Presidential Search website periodically for updates. Contact our search consultants from AGB Search to make a nomination by emailing Shannon McCambridge or Dr. Loren Anderson. Are internal candidates treated any differently than external candidates? Internal candidates are vetted in the same way as external candidates. All candidates are assessed based on the criteria laid out in the Presidential Search Profile. The committee very carefully selects the strongest candidates, either internal or external, for further consideration based on the presidential search qualifications and experiences. How will members of the St. Scholastica community participate in the search process? There will be opportunities for the community to meet with the search consultants in mid-February to discuss the College and attributes to be sought in our next President. Details will be sent in a future communication from Joan Holter, Administrative Assistant to the Vice President for College Advancement, who will be providing administrative support for the search. 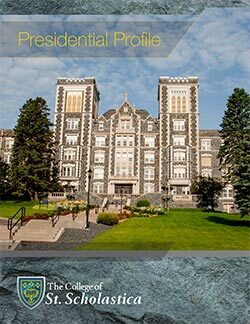 Soon after AGB is on campus, the Presidential Search Profile will be finalized and made public. When finalist candidates are selected, members of the St. Scholastica community will be strongly encouraged to meet with each of them. In addition to a campus-wide forum, finalist candidates will meet with all key constituent groups. There will be multiple opportunities to meet with the candidates. When will our next president take office? The next president is expected to take office in the second half of 2019. The exact date will be determined upon consultation with the selected candidate and the Board of Trustees.